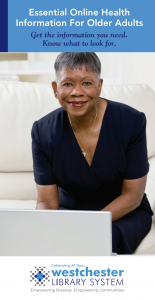 This workshop teaches older adults how to find, use and assess the online information you need. Learn about authoritative sources on health matters – from diseases and conditions to evaluation of doctors and hospitals; from drugs and supplements to Medicare management. Know where to start and what you can expect from these online tools. Discover sources worth mastering and practices that will keep you safe online. If you can, please bring your own laptops to the class. Registration is required; please go to our online calendar at www.somerslibrary.org or call 914-232-5717.